NOTE: If you purchase only one side view camera, please indicate the camera is for which side of your car. The rubber pad at the bottom of the camera is designed for the specific side of the car to prevent the water from leakaging into the vehicle. LCD VIEWING MONITOR SOLD SEPARATELY. WE HAVE VARIOUS MONITORS FOR YOU TO CHOOSE. PLEASE VISIT OUR OTHER PAGE UNDER LCD MONITOR/REAR VIEW BACKUP SYSTEM SET TAB. 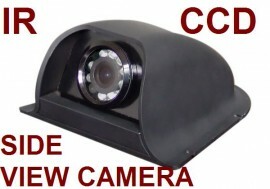 YOU CAN CHOOSE ANY MONITOR FROM THE COMBO ITEMS(LCD MONITOR + CCD CAMERA) AND PURCHASE WITH THIS CAMERA. Water-proof without extra housing and vandal proof: for part (camera glass lens) exposed to outside ONLY and for normal usage ONLY. Camera body and cables are not designed to be exposed to outside and must be properly sealed against moisture. Incorrect installation and using the product in opposition to the manufacturer's instructions MAY result in loosing water-proof feature. Notes: when you install the camera, make sure the weep holes at the rubber pad at the bottom of the camer facing downwards. With the weep holes facing upwards, the water running down the side of the coach would enter the camera housing and fill it up -- causing water leakage into the vehicle and or housing breakage issues if it freezes. Approx. 4.3" x 2.2" x 4.4"